Malkolm Boothroyd is 17. He lives in Whitehorse in the Yukon, a province at the northern tip of Canada. It’s a wild mountainous place, with huge caribou herds, moose, bear, and foxes. It’s also a place where climate change is already evident. The winters are shorter. The permafrost and sea ice are melting. And for young people like Boothroyd, it’s a source of worry. Boothroyd says already the native Inuit tribes are having a harder time living off the land. And he felt frustrated by what he sees as the Canadian government’s lack of action. The government has not kept international commitments it made to reduce the gases that cause climate change. So he decided to head to the capital city of Ottawa to lodge his complaint. Ottawa is 3,700 miles away from the Yukon. Boothroyd hopped on his bicycle. It took him just under three months to ride from the northwestern tip of Canada near Alaska to Ottawa, which is just north of New York State. His mom rode with him for the first 1,200 miles. 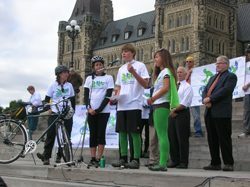 Then he joined up with other young riders, arriving for a rally on Parliament Hill in late September. About a dozen members of Parliament and maybe 50 cyclists showed up for the rally. Boothroyd talked to hundreds more as he rode across the country. He says he wasn’t just doing it for a good cause, he was doing it to protect his home. Now, Boothroyd is a regular twelfth grader again. But unlike most, he’ll be keeping a close eye on the climate change talks taking place in Copenhagen in December. He’s hoping his effort convinced the Canadian government to do more. and contamination can hurt our health. 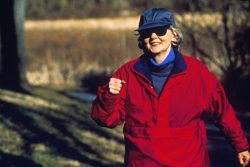 Many of us have engineered physical activity out of our lives. We sit in front of the computer, we sit and drive everywhere. We don’t move much. That’s what Steven Blair says. Blair is a professor of Public Health at the University of South Carolina. And he says, more than anything else, America’s physical in-activity will cause this century’s biggest public health problems. He says we need to re-engineer physical activity back into our lives. And part of that includes making communities super walk-able and bike-able. Kathryn Stewart doesn’t own a car. She’s never even had a driver’s license. She’s an editor at a publishing company and commutes mostly by bus and by bicycle. And while you might think you know plenty of people like Stewart, especially in big cities such as New York or Chicago, consider this: Stewart lives in Phoenix – the land of freeways and strip malls and summers that top 115 degrees. Stewart’s work is just a few miles away, but it takes her half an hour to get there. 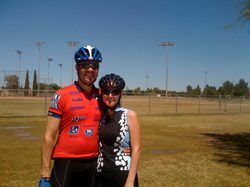 She says one of the hardest parts of being carfree in Arizona are those broiling summer days. But she has a secret weapon – a heat-shielding umbrella that she daintily refers to as her parasol. But major cities in the US aren’t necessarily built for people who like to walk to work. This is especially true in the West. Carol Johnson is a planner for the city of Phoenix. She says this is due, in part, to a theory that was popular in the 1960s, when everything was planned for the car. But a lot of cities now are trying to get people out of their cars. They want to cut pollution and ease traffic problems. The mayor of New York, for example, proposed a fee on cars to get more people to take public transit. And San Francisco hosts “CarFree Days” where they promote walking, running, and bicycling. Okay so this may all sound well and good, but what does being carfree mean for Kathryn Stewart’s social life? How does she meet people and have any fun in this city built for cars? Turns out she manages. She and her boyfriend – Roger Williams – see each on weekends. They like to take bike rides. They live about 30 miles apart – not a long car trip, but by bike, the ride can take two and a half hours. Williams owns a car, but he figured out pretty early on in their relationship that a willingness to be carfree was a good way to impress her. Stewart and Williams also encourage each other to be healthy and have less of an impact on their environment by the foods they eat. But being carfree, that’s the main sacrifice. Stewart says she realizes it’s big change most people would have a hard time with. But it’s a choice she’s dedicated to in order to do something about global warming. For The Environment Report, I’m Rene Gutel. Matari Yumoja isn’t the typical bicyclist – yet. He’s young, African American, and lives in the suburbs. But on a recent weeknight, he was in the city hauling around his un-ridable hand-me-down bike. And trying to figure out how to get it working. In fact, Matari’s bike tires kinda looked like they’d been run over – more than once. Matari didn’t know how to fix them, and didn’t have money to spend at a bike shop. But on this clear spring night, none of that mattered. 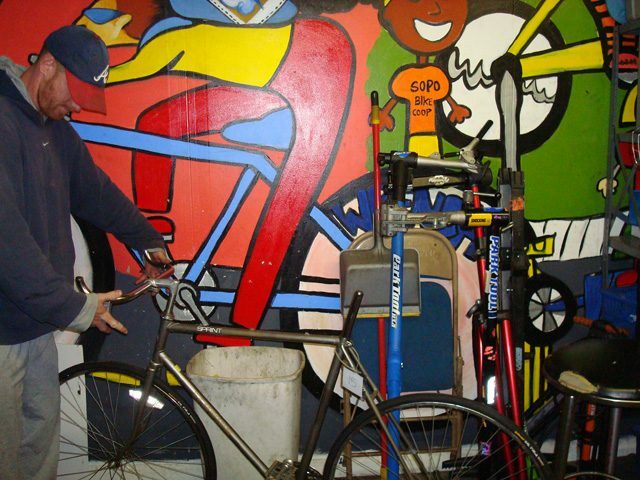 “Big John” Brazwell is a regular at the Sopo Bike Cooperative in East Atlanta. Sopo is one of more than a hundred bike co-ops that have opened around the country over the last few years. They’re do-it-yourself community centers with tools and used, donated, and salvaged parts. People like Matari can learn to take old wheels, or handlebars, or seats and put them on other bikes. They end up with a functional bike that’s cheaper – and more unique than what they’d find in a store. Rachel Speewack is the founder of Sopo. Speewack likes her Frankenbikes, and the bike coop model because they help people who want to start biking but don’t know where to start – like Matari Yumoja. And bicyclists like Big John are more than happy to teach what they know. When Sopo opened 3 and a half years ago, Rachel Speewack couldn’t have known gas prices get so crazy – or that the economy would tank. But in car-centric, sprawling Atlanta, she and a few friends wanted to show that bikes could be a cheap, environmental, and practical. When gas prices went up last year to more than $4 a gallon, Speewack watched as the number of visitors to its donations-only shop grew and grew. Just about everyone was looking for an option besides driving. Now with more people out of work and pinching pennies, Sopo’s seeing even more people coming in with their bikes, looking for help. During January and February, 275 people came to Sopo – even though the shop’s only open a few hours a day. Some came in a few times every week. But the bike coop’s popularity doesn’t really surprise anyone, including Speewack. And there’s so much demand and interest it’s not just Sopo that’s coming in. New bike coops are still opening around the country – even in cities that haven’t always been seen as friendly to human-powered transportation in the past. 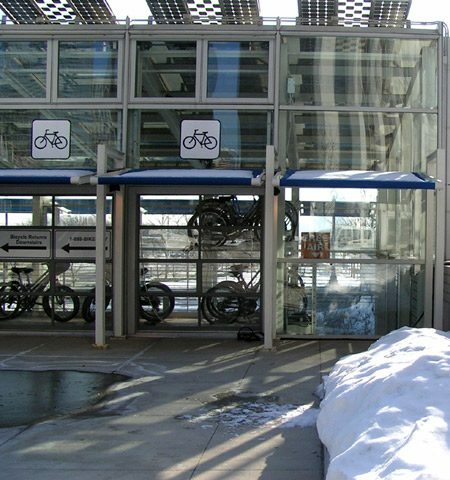 But these days all the co-ops – whether new or slightly less new – are happy to watch people who came in carrying their bikes leave riding them. After all, those same people often come back and help someone else looking for a new start on an old bike. For The Environment Report, I’m Dana Goldman. honor people killed while riding bicycles. they chain them to a post near the site of the bicycle fatality. people die in motorized vehicles. accident rates from going up. best way to explore the city was to bike it. “And I was run off road by cars, and people shouted and screamed at me. art piece of sorts. It’s called The Walking Project. all be uploaded to a computer and transformed into a sort of 3-D digital map. “…oh look at path here…this is a great shortcut. Is there a story here? Block and Ramsden snap pictures and record everything he’s saying. path. In hopes that maybe one day they’ll have a map to call their own. For the GLRC, I’m Jennifer Guerra. pollution, use less energy, or they want to save money on commuting. everywhere. She was fed up, so she tried biking. For a while, each ride was a kind of … personal triumph. winter. She stayed off her bike and hopped the bus instead. herself and her bike for winter. She’s come to the right place. If anyone’s capable of teaching Julie and the other folks here, Alex is. “I just can’t find any inherent bad in bikes. Plus, bikes are fun, you know. what rain gear. Alex says trial-and-error works best. Alex says all this mechanical advice is important but misses the point. encouraged and she peddles out of the seminar, with her resolve intact. These strangers offered useful tips on clothes and safe routes. adventure, but she changed her tune after the season’s first major storm. “There was snow and it was slippery and they hadn’t put salt down yet. to say, it’s personal, and, to her, important. 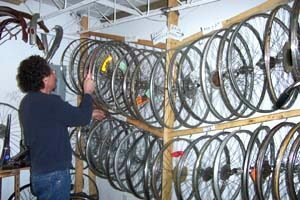 A volunteer at re-Cycles looks for a replacement. 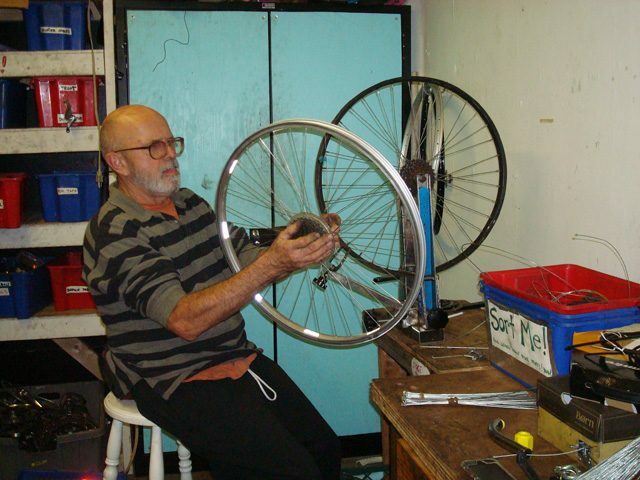 Volunteers teach bike repair to amateurs and novices. Their goal is to get people out of their cars and onto their bikes. Photo by Lisa Routhier. 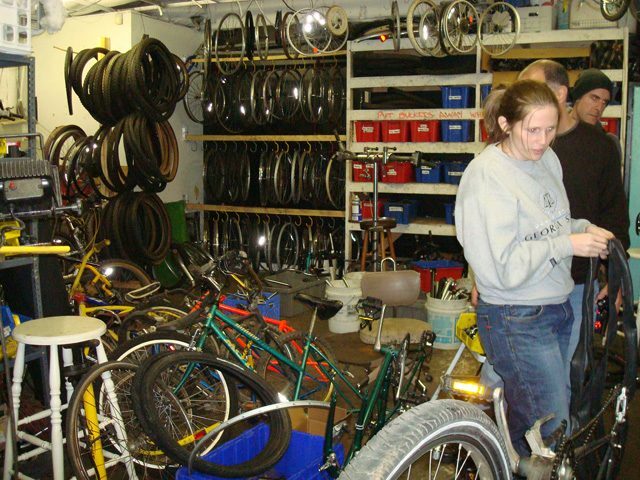 some cycling advocates are helping ordinary people become amateur bike mechanics. It’s the perfect day to work on your bike. Rainy and cold. But the forecast says warmer weather is ahead. 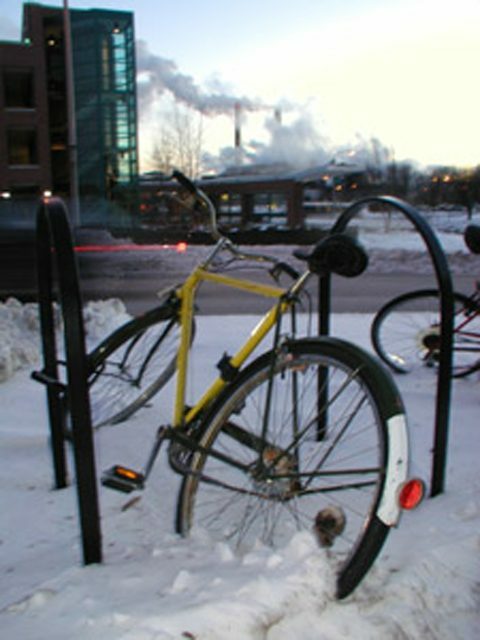 bicycle cooperative based in Ottawa, Canada. It’s called Recycles. And it’s a bike repair shop that’s open to everyone. parts. Fenders and inner tubes hang from the ceiling. tools and advice from mechanics. Mark Rehder is the coop’s director. He’s a firm believer that anyone can fix a bike. mission is simple – to get people out of their cars. as a client tightens nuts on the other. group also receives some outside support. Equipment Co-op, a Canadian nonprofit that sells outdoor gear. convinced it’s an ideal way to change society. they look forward to a day when cyclists will have the roads to themselves.